I couldn’t see the inanimate object, but I could hear it speak. The Epipen had a voice like an Italian mobster if you can believe that. The thing probably wore a sharkskin suit, something full of money and pizzazz. It told me who it was while parked outside the pharmacy. My fingers hadn’t turned the key in the ignition yet. 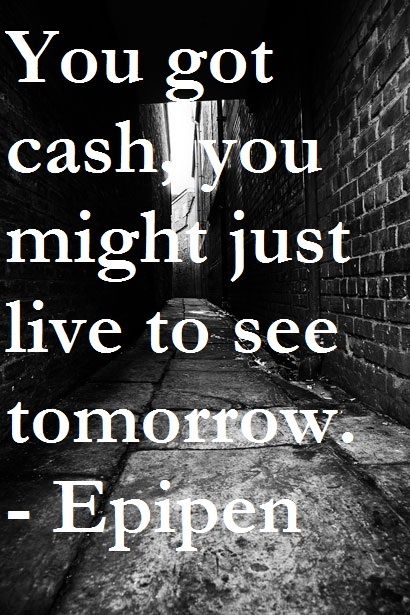 I was still in shock about the six hundred dollar Epipen cost and that I had to leave the pharmacy empty-handed. The bruises and tape marks from my hospital stay made it hurt to bend my elbows, but I gripped the steering wheel in shock nonetheless, thinking I was about to be robbed until the inanimate object clued me in to its identity. First the severe allergic reaction to some unknown crap, now this. I wanted to tell him I hated being an American. I hated rocks and hard places. And being American, more than anything else, often meant getting used to just that. Here’s a rock. Here’s a hard place. Here’s you. But he was right. I had no choice. “I hate you, Epipen,” was all I could manage to say. Was my “fictional” tale too transparent? Six days after overnight hospital stay, still no pen! I liked your response with hesitation. Certainly I don’t like your situation. UGH. Epipenitentiary. Some day perhaps I will own one of my very own. Maybe with a certificate of authenticity and everything! You let us know the moment you get it. Epipenance! I can feel one out there just waiting for me. Epipending. I wonder if there’s an epipen rescue organization you could contact. For now I have given up to focus on allergists and painting the laundry room. Sounds like a wise plan.